I’ve been seeking new places where I can eat, drink and work with my laptop so I get out of my home more during the day. 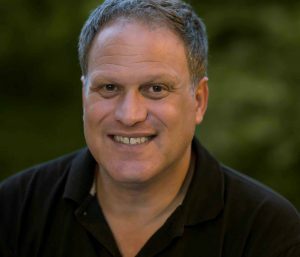 In addition, it’s important to me that the staff and the place’s vibe are welcoming. I want to feel comfortable setting up my laptop to work a few hours. Of course, I expect to drink and eat in while working to justify taking a space. Surprisingly it has been quite difficult to find places in and around Hollywood that meet my criteria. To work during breakfast or lunchtime, I seek a cafe or restaurant with a wide selection of healthy dishes, including vegan choices. Being able to order a different dish from one day to the next is essential. 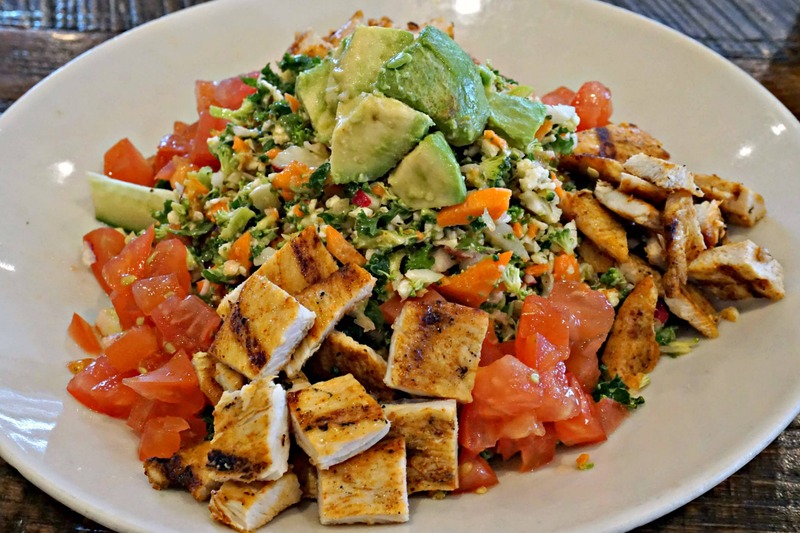 Even in Los Angeles where vegan choices in restaurants are more common than in other parts of the world, relatively few cafes offer several vegan options for lunch. The vegan choices at dinner are even more scarce. Sadly in this Internet age with cheap WiFi service, many food and drink establishments have poor Internet coverage or offer free WiFi for only a limited time, such as 30 or 60 minutes. Writing a blog post in less than 60 minutes is impossible. Just when my creative juices start to flow smoothly, I’d have to find a new place to work! 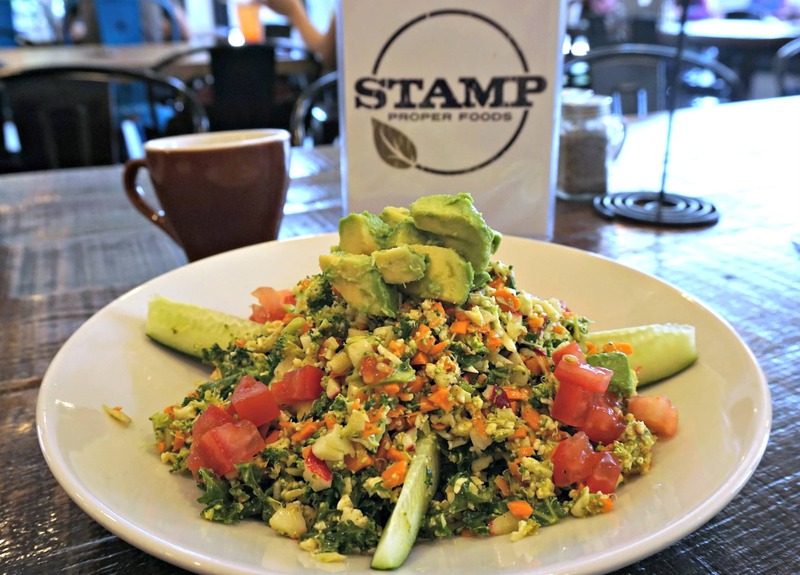 A few weeks ago I stumbled on a gem of a place: Stamp Proper Foods, a cafe with many tasty and healthy food and beverage options. 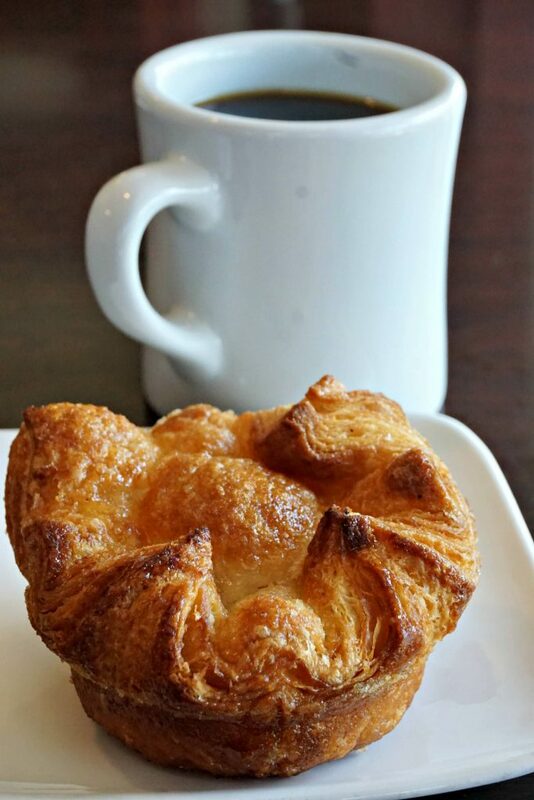 You can enjoy your items at the cafe or take them to go. There are also many nutritious bottled drinks and packaged snacks that you can purchase to take with you if you are in a hurry. Stamp Proper Foods meets all the qualities I look for in a cafe where I can enjoy food and drinks while working. Its location makes it easy to reach and to find parking. The atmosphere is welcoming, warm and comfortable, with plenty of natural light. It also has free WiFi with excellent coverage. The menu features a wide range of healthy and tasty food and beverage choices. There are also many vegan, gluten-free and vegetarian options. The service is friendly, professional and quick. 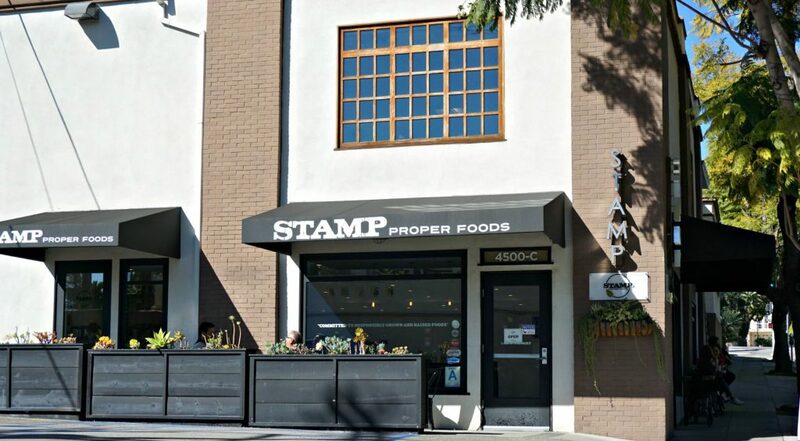 Stamp Proper Foods is located at 4500 Los Feliz Boulevard, in Los Feliz (Los Angeles). Although its address is on Los Feliz Boulevard, the main entrance is on Hillhurst Avenue. Stamp Proper Foods is very close to Griffith Park, the Griffith Observatory and paths to the Hollywood Sign. Hillhurst Avenue leads you straight up to the renown Griffith Observatory where you can enjoy amazing views of the city as well as of the Santa Monica Mountains. After a hike, stroll or picnic in the park you can visit Stamp Proper Foods to rehydrate and regain your energy. 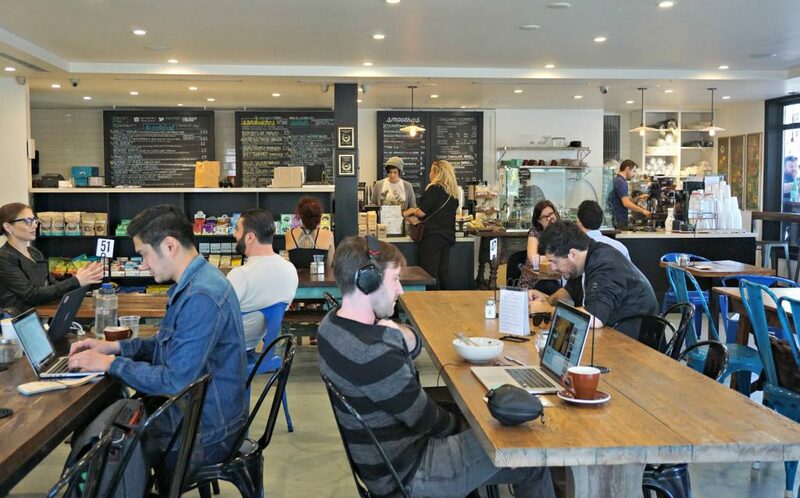 Los Feliz Boulevard is also a main route for many heading in and out of Los Angeles via Highway I-5, making Stamp Proper Foods an ideal place to stop for breakfast on your way to work or for drinks or a light supper on your way home in the early evening. 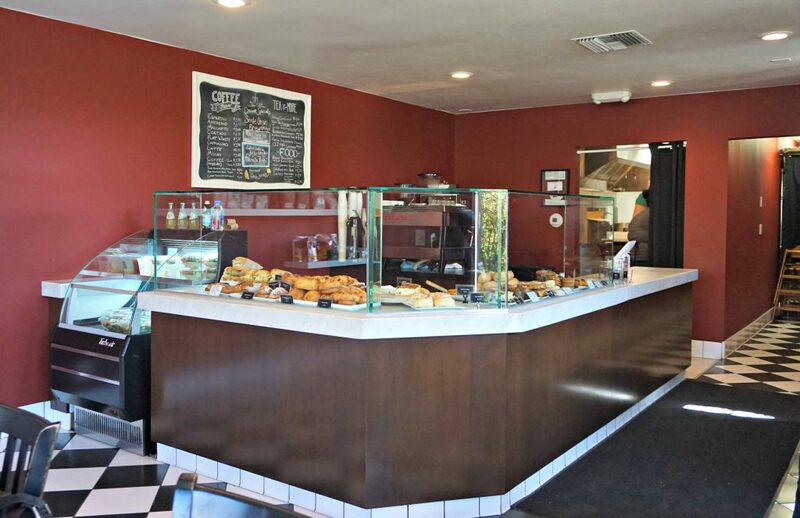 If the traffic on Los Feliz Boulevard or the highway looks too heavy, stop at Stamp Proper Foods to avoid the stress and savor a healthy snack. It’s not a detour at all so you can quickly rejoin the route when traffic lightens. Stamp Foods Proper has a small parking area on its side. In addition, you can find abundant easy free parking on the surrounding streets. I have never had a problem parking nearby. I felt at home the first time I walked in the door at Stamp Proper Foods about one month ago. The main dining room is a large open space with lots of windows (i.e., natural light), clean white walls and wood tables, some individual others communal. The wood makes the place warm and comfy. They also have several tables outside along the side and front of the cafe where you can lap up Los Angeles’ sunny weather. When I noticed several people working on their laptops (mostly Apple), I knew immediately this was a good place to work. Clearly others before me chose Stamp Proper Foods for the same purpose. A few regulars grab a seat near the side window (on the parking lot side) so they have easy access to one of the few electrical outlets available in the cafe. If you come here to work, charge your laptop and other devices in advance or bring your own external recharger battery. The pop music playing in the background is pleasant and not distracting. It’s not too loud like at many eating establishments these days. Stamp Proper Foods offers a fairly long list of breakfast items, sandwiches, salads and smoothies. 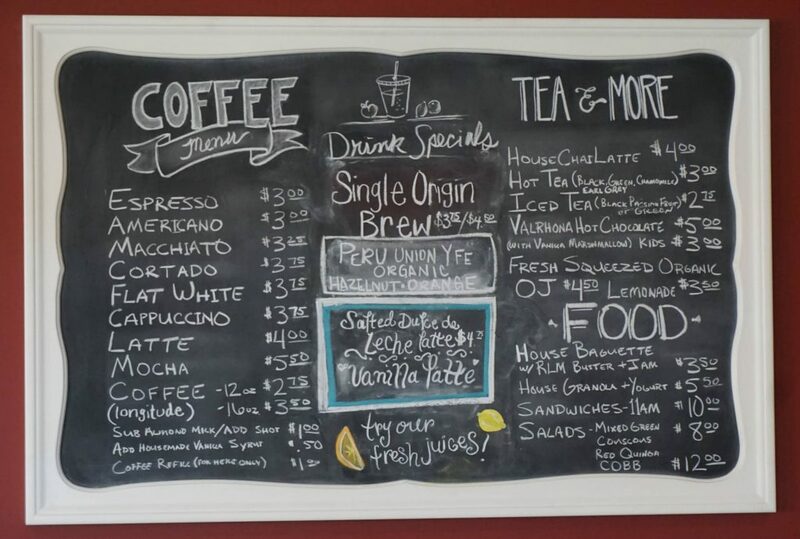 It also serves organic coffee, tea, juices and other cold beverages. I usually order their delicious drip coffee because I can get endless refills while I work. I’ve heard that their special coffee and espresso drinks are also excellent. All the coffee comes from Stumptown Coffee Roasters, originally from Portland, Oregon, so you can count on its high quality and full-bodied roasted flavor. If you have dietary requirements or are just health-conscious like me, you will be happy to know that all items are marked if they are vegan, vegetarian and/or gluten-free. Actually almost all of the choices on the menu seem to meet at least one of these criteria. Many ingredients are also organic. I have tried many salads as well as a couple sandwiches at Stamp Proper Foods. Not at the same sitting, of course. 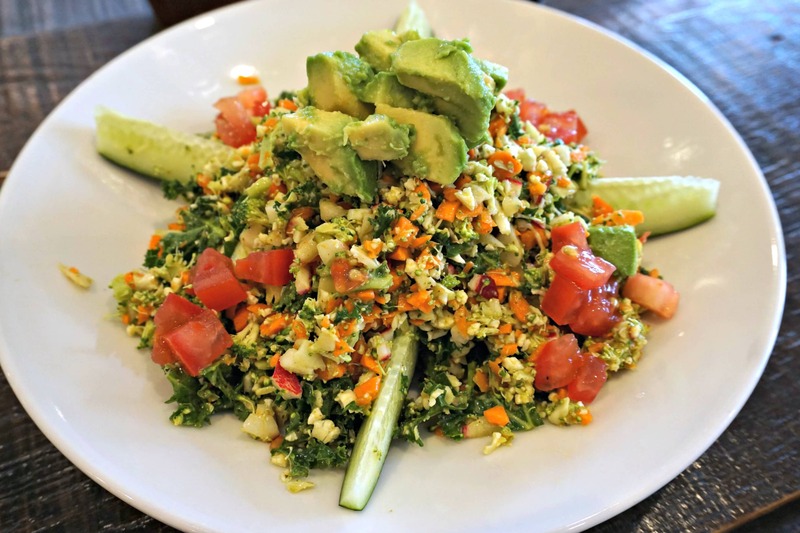 My favorite is the DC Chop Salad (vegan and gluten-free) with finely chopped broccoli, kale, carrots, radish, cauliflower, cucumber, avocado and tomato tossed with your choice of dressing. The parsley vinaigrette pairs particularly well with the DC Chop Salad. Other dishes I have enjoyed include the Kelp Noodle Salad (vegan and gluten-free), the Kale Cobb Salad (gluten-free) and the Raw Zucchini Linguini Salad with pecan pesto sauce (vegetarian and gluten-free). On any salad you can add your choice of protein: antibiotic-free chicken, wild salmon, garbanzo beans, organic non-GMO tofu, or goat, feta or blue cheese. I have added chicken or tofu a couple times and was very happy with the result. You order and pay for your food and drinks at the counter at Stamp Proper Foods. Someone will then bring you your dishes to the table, unless you’ve ordered it to go. The personnel seem to work in different functions. I’ve seen someone at the counter one day serving food the next day. It’s great because you have a chance to meet everyone if you come here regularly. Everyone I’ve met working at Stamp Proper Foods so far has been quite friendly and professional. No attitude or bad moods that customers have to navigate around. I’ve always felt welcomed and never pressured to give up my seat for someone else. The people working at Stamp Proper Foods definitely contribute to its warm comfortable atmosphere. Stamp Proper Foods can be very busy at lunchtime from noon to 3 pm. I have not yet visited this cafe for breakfast to see the crowd size. 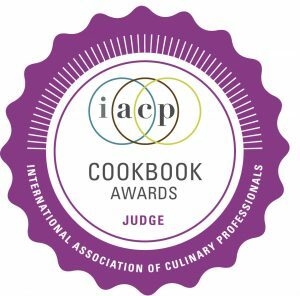 Fortunately, there is always sufficient personnel to prepare and serve the food in a timely manner. The service at Stamp Proper Foods is certainly a plus! In general I find the prices to be in line with the quality and quantity of the food and beverages served. There are also choices at different price ranges, making it easier to come here on a regular basis. The salad portions are healthy. When I order salad as my main course, I want it to be fairly large to keep me satisfied at least a few hours. The serving size for the additional protein is also very ample. Try one of the 24 oz (700 ml) fresh-made smoothies at Stamp Proper Foods. At first I found the price of their smoothies to be relatively high, given that I can make one at home. Most of their smoothies cost $7.50. Then one day I chose to have their Palm Spring Poolside smoothie made with pineapple, banana, ginger, coconut milk and coconut water for a light lunch. This yummy and healthy smoothie satisfied my hunger pangs and kept me going until dinner. When I consider that Stamp Proper Foods provides free WiFi with great coverage, tasty and healthy food, good-size servings, friendly staff, and easy parking, I am extremely pleased with what I receive for the price paid. The price for the food and drinks is comparable to other places in or around Hollywood, yet the other establishments do not offer all the features I can count on at Stamp Proper Foods. So far in my six months in Los Angeles, I have not found another place that meets all of these criteria! I would recommend visiting Stamp Proper Foods for a meal or a snack. Come to do some work, to read or to chat with friends. Enjoy a large selection of tasty and healthy food and drinks at reasonable prices and with friendly service. See my review above and keep in mind that I rarely give more than 4.5 / 5.0 for anything. There’s always room for improvement. I also keep a spot for truly the exception. All my ratings are assessed keeping in mind the type of establishment being reviewed. I evaluated Stamp Proper Foods relative to other cafes in Los Angeles offering similar food and beverages. Close to Stamp Proper Foods on Hillhurst Avenue are several other interesting places to eat and drink or to shop for food. There’s McCall’s Meat and Fish Company, which offers high quality, local and socially responsible meat, poultry and fish as well as other side items and tasty desserts. One of my favorite chocolate chip cookies so far comes from McCall’s. 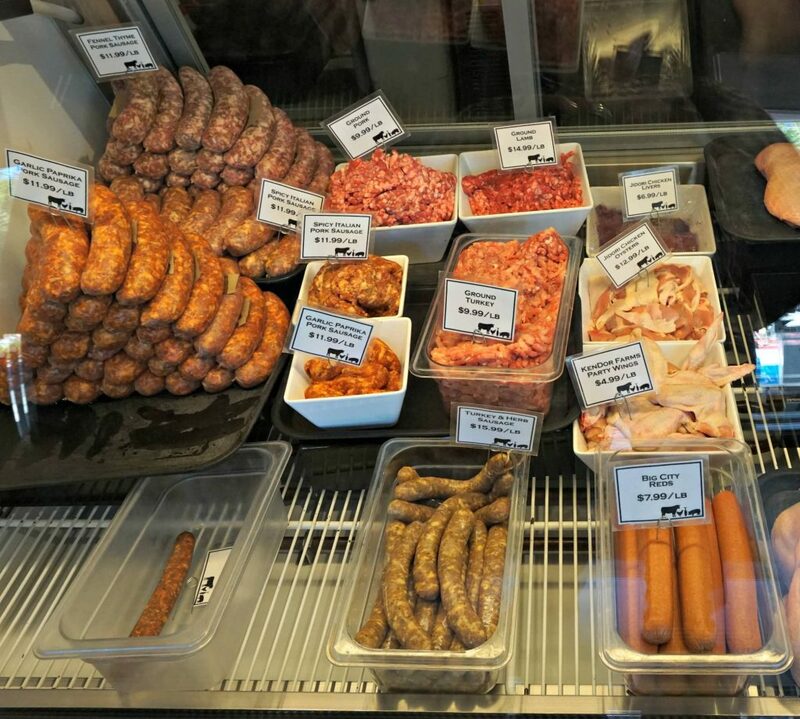 Homemade Sausages at McCall’s Meat and Fish Co.
Lassens Natural Food and Vitamins features an impressive choice of organic and natural foods, including fresh produce and items by the bulk. In the back there’s also a counter where you can order food and drinks to go. It definitely has a wide enough choice to allow you to skip a stop at Whole Foods Market or Sprouts Farmers Market. Yuca’s Tacos is a longtime favorite in the neighborhood. 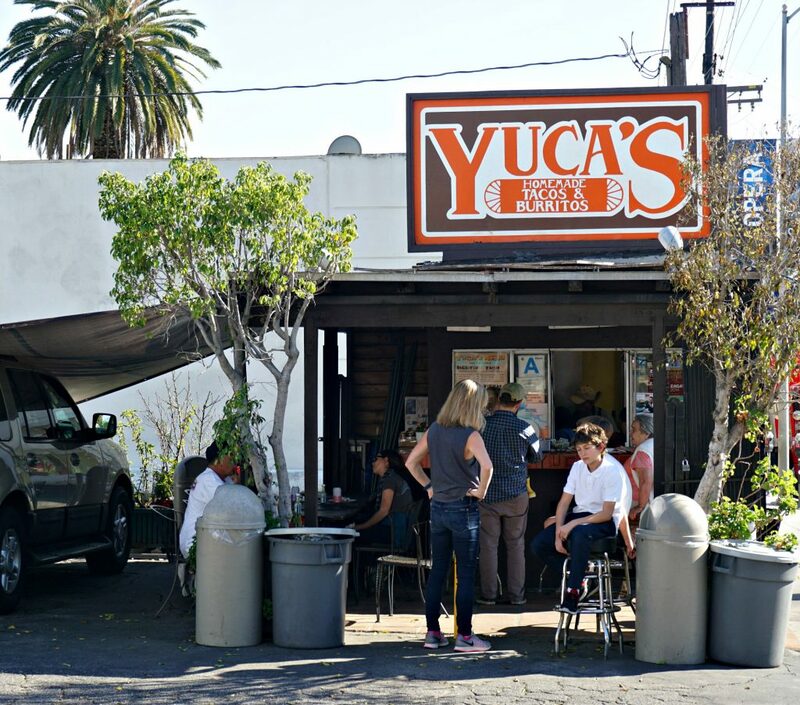 Yuca’s Tacos on Hillhurst Avenue is the original stand (or hut). There are always people standing in line or eating in front of this charming stand. A sister Yuca’s Tacos can be found nearby on Hollywood Boulevard. Community, a restaurant with several communal tables, homey atmosphere, and an attractive menu, was near the top of my places to try soon. 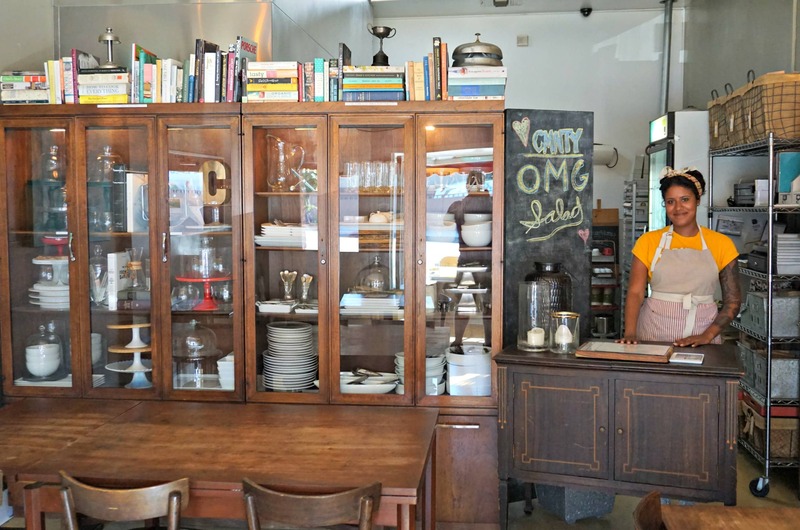 Since this article was first published I lunched at Community. You can read my review of Community by clicking on this link. Twenty40 is a cafe with excellent sweets and coffee opened up recently by the same owners of McCall’s Meat and Fish Company. 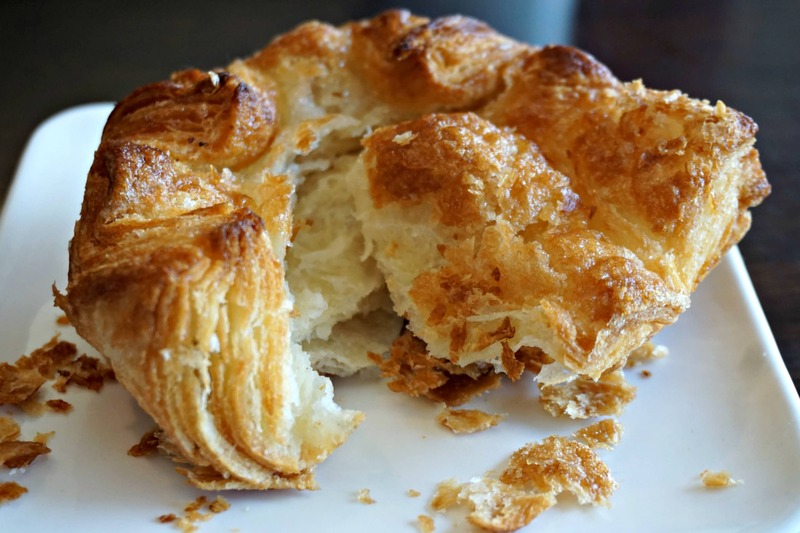 They are known for their Kouign Amann, which I found very good but a bit pricey. I love the atmosphere here yet there are very few tables and seats (about 15 seats in all inside and outside) and there is no WiFi available. Given the cozy size of the place, they probably do not want people lingering long. 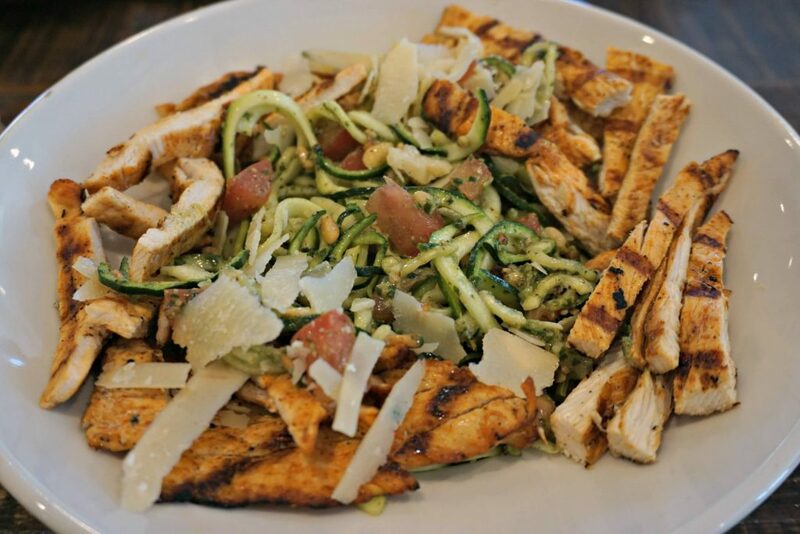 Twenty40 has quality sandwiches and salads to go at lunch time. 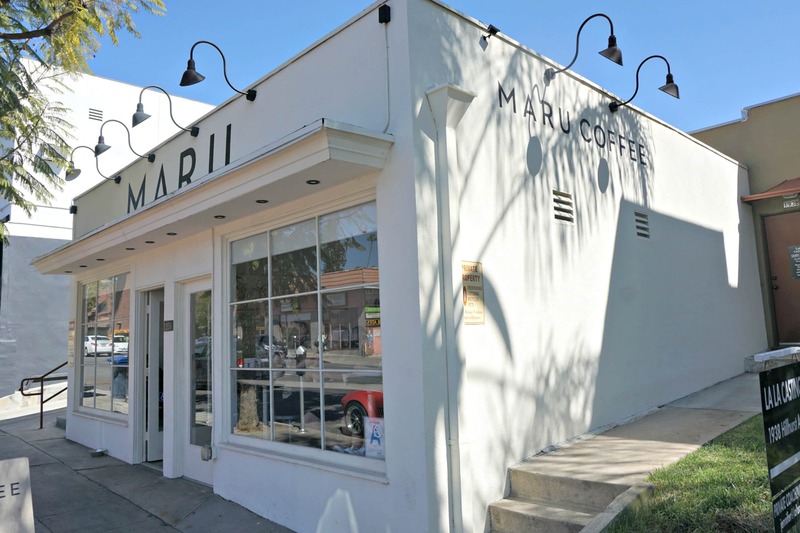 Maru Coffee is a new addition on Hillhurst Avenue. Its zen atmosphere and excellent coffee attracts a lot of people, especially in the morning. It can be hard to find a place to sit when it’s busy. The above list is by no means exhaustive. I haven’t forgotten Mustard Seed Cafe, Farfalla, Little Dom’s or Mexico City. I plan on visiting more establishments in this Los Feliz neighborhood and on sharing separate reviews. Check back on my site for more information and photos for these places.